Aims: The purpose of this study is to investigate the role of Grail in stress-induced apoptosis and tumorigenesis in oral cancer cells. Subjects and Methods: We analyzed gene expression of Grail in oral cancer cell lines (KB, SAS, SCC-4, and SCC-25) treated with 5-azadC or/and trichostatin A (TSA) by RT-PCR. 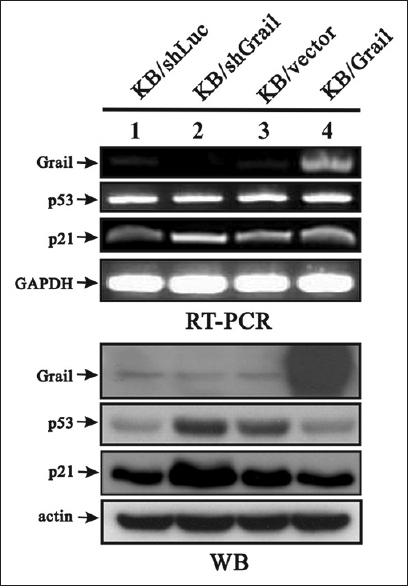 The effects of Grail on the expression of p53 and p21 were analyzed by real-time polymerase chain reaction and Western blot for KB cells (KB/vector, KB/Grail and KB/shGrail). The anti-apoptotic effects of Grail were determined by fluorescence-activated cell sorting in KB/vector and KB/Grail cells. The effects of Grail on tumorigenesis were through clonogenic analysis in KB cells (KB/vector, KB/Grail and KB/shGrail). Results: Treatment with 5-azadC or/and TSA-induced Grail mRNA expression in oral cancer cells. Grail overexpression reduced p53 and p21 expression. Conversely, p53 and p21 expressions were increased in KB/shGrail cells. Furthermore, Grail can inhibit resveratrol-or etoposide-induced apoptosis in KB cells. Finally, Grail can significantly suppress colony formation in KB cells. Conclusions: The expression of Grail is epigenetically regulated in oral cancer cells. Grail can reduce p53 and p21 expression and stress-induced cell death and suppress the colony formation in KB cells. Grail is a type I transmembrane protein localized in the transferrin-recycling endocytic pathway, and it plays a crucial role on the induction of anergy by abrogating the expression of cytokines in T cells. A recent study has shown that Grail forms a ternary complex with Otub-1 and USP8, which regulates T cell anergy., Recently, a number of proteins were identified to be associated with Grail. As mentioned above, Otub-1, USP8, and Grail constitute a complex, thereby mediating T-cell unresponsiveness. Moreover, Grail can regulate the levels of the co-stimulatory molecule CD40 L on CD4-T cells by interacting with CD40 L and by subsequent degradation during the induction of anergy. CD151 and CD83 have critical roles in CD4 T cell activation. Previous studies have shown that Grail can regulate expression of CD151 and CD83 through ubiquitin-mediated protein degradation.,, Moreover, the Rho guanine dissociation inhibitor (RhoGDI) has been shown to be associated with Grail and is capable of mediating T cells activation, which in turn inhibits the RhoA GTPase activity through increasing the stability of the RhoGDI; RhoA GTPase has been shown to regulate the organization of the cytoskeleton and IL-2 expression. Another study demonstrated that the mammalian target of rapamycin (mTOR) pathway mediates cell-cycle progression and proliferation of naïve T cell by regulating the expression of Grail. This evidence implies that Grail may play an important role in cell cycle arrest and proliferation. Together, these observations demonstrate that Grail can exert multiple biological functions besides the induction of anergy. In addition, our previously published data showed that a novel p53 interacting protein, Grail, formed a negative feedback loop. Grail physically and functionally interacted with p53 to degrade it and modulate its transactivation activity. Based on this evidence, Grail may play an important role in the tumorigenesis, and thus, the expression levels of Grail could be tightly controlled. Here, we would like to study the epigenetic regulation of Grail gene by detecting the mRNA and protein expression levels of Grail under the treatment of the DNA methylation inhibitor 5-aza-2'-deoxycytidine (5-azadC) and/or the histone acetylation inhibitor trichostatin A (TSA) in various oral cancer cell lines. At the same time, we examine the effect of Grail on stress-induced apoptosis and tumorigenesis using fluorescence-activated cell sorting (FACS) analysis and an anchor-independent assay, respectively. These results provided further understanding about the possible functional role of Grail during the course of tumorigenesis. The oral cancer cell lines (KB, SAS, SCC-4, and SCC-25) were cultured in Dulbecco-modified Eagle's medium supplemented with 10% fetal bovine serum and 1% penicillin-streptomycin (Invitrogen, Carlsbad, CA, USA). Cells were harvested in lysis buffer (50 mM Tris pH 8.0, 5 mM NaCl, 0.5% NP-40 and 1 × protease inhibitor), freeze/thawed three times, and the protein recovered. The protein concentration was determined using the Bradford method (Bio-Rad, CA, USA). The cell extract was then suspended in SDS-PAGE sample buffer, boiled, and loaded onto an SDS-polyacrylamide gel. The separated proteins were transferred to a nitrocellulose membrane, and the blot was probed with the indicated primary antibodies followed by a secondary antibody (horseradish peroxidase-conjugated anti-mouse or anti-rabbit IgG in phosphate-buffered saline (PBS)/Tween 20 with 5% Carnation nonfat milk). Proteins were detected using enhanced chemiluminescence reagents (GE HealthCare). The primary antibodies used for immunoblotting were: monoclonal anti-p53 (pAb421), anti-actin (MAb1501; Chemicon, USA), anti-actinin (H-2; Santa Cruz Biotechnology, Santa Cruz, CA, USA), polyclonal anti-Grail, and anti-p21 (C-19; Santa Cruz). The Grail was cloned into the retroviral plasmid vector, pQCXIP (Clontech). The pQCXIP-Grail and pQCXIP-empty plasmids were later transfected into GP2-293 cells using Fugene 6 (Roche, Basel, Switzerland). Grail retrovirus was prepared according to the protocol published on the Clontech website (Grail shRNA target sequence: 5'-gcaggaagcagaggcagttaa-3). The shRNA oligonucleotides were cloned into the retroviral shRNA expression vector, pSIREN-Retro-Q (Clontech). Retroviruses overexpressing Grail shRNA was generated according to the protocol published on the Clontech website. Cells were infected with the indicated retroviruses in selection medium containing 2 μg/ml polybrene. Forty-eight hours after infection, cells were treated with 8 μg/ml puromycin to select for a pool of puromycin-resistant clones. Analysis was based on the measurement of the DNA content of cell nuclei labeled with propidium iodide. To evaluate the cell cycle profiles, cells were treated as for the proliferation experiments, washed with ice-cold PBS, and incubated with propidium iodide (0.05% in PBS, 0.1% Triton X-100, and 0.01% RNase) for 15 min at room temperature in the dark. Cells were subsequently analyzed using a FACSCalibur flow cytometer (BD Biosciences, Franklin Lakes, NJ, USA), and the data were analyzed using Cell Quest Pro software (BD Biosciences). Cell suspensions (1 × 104) were incubated in an upper layer of 0.3% agar (Difco, Detroit, MI, USA) in DMEM with 2% FBS. This was overlaid on 0.5% basal agar with 2% FBS. Cultures were kept cultured for two weeks, replenishing the upper medium layer twice a week, and then stained with methylene blue diluted in ethanol. Colonies were counted under microscope. One-way analysis of variance was used to assess the difference of means among groups, and Student's two-tailed t- test was used to determine any difference in means between any two groups, and P < 0.05 was taken as statistically significant. Clinical data obtained from Affymetrix microarray analysis revealed that the expression levels of Grail in tumors are lower than those of normal counterparts (http://www.ncbi.nlm.nih.gov/geo/). As a result of this bioinformatic data, we moved sought to analyze the mRNA expression pattern of Grail in a panel of oral cancer cell lines. Our results demonstrated that the abundance of cellular mRNA of Grail was lower in KB and SAS cell lines, but not in SCC-4 and SCC-25 cell lines [Figure 1]. These findings revealed the possibility that gene expression of Grail was transcriptionally regulated by either promoter methylation or histone acetylation. To this end, we addressed whether the regulatory mechanisms of Grail included DNA methylation and histone acetylation. 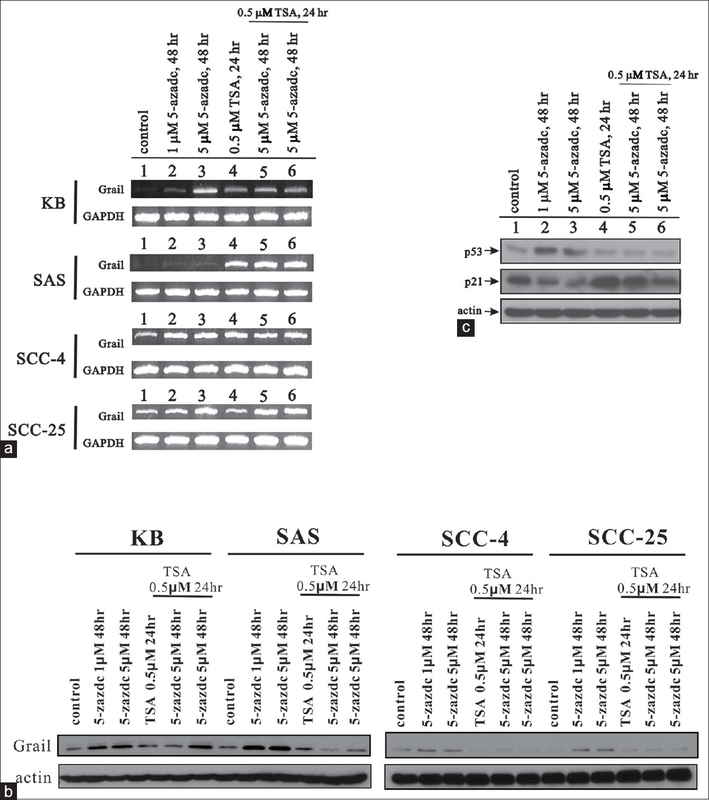 For this experiment, several human oral cancer cell lines, including KB, SAS, SCC-4 and SCC-25, were treated with DNA methylation inhibitor (5-azadC) or/and histone acetylation inhibitor (TSA). As shown in [Figure 1]a, compared with control group, 5-azadC (1 μM and 5 μM) or TSA (0.5 μM) treatment has significantly increasing Grail's expression. In addition, compared with lane 3 or lane 4, 5-azadC (5 μM) and TSA (0.5 μM) cotreatment failed to enhance Grail expression [Figure 1]a. To further characterize the relationship between Grail expression and tumorigenesis, we measured the protein levels of Grail in the identical conditions. Similar to the observations in [Figure 1]a, treatment with 5-azadC also increased Grail's protein levels but not TSA [Figure 1]b. The data showed that 5-azadC and TSA could increase Grail expression in these cell lines, suggesting that the expression of Grail was epigenetically regulated. Since Grail is identified as a p53 interacting protein from our previous study, we wanted to determine the correlation between Grail, p53, and p21 after treatment with 5-azadC or/and TSA. As shown in [Figure 1]c, compared to control group, p53 levels can be significantly increased after treatment with 5-azadC (1 μM and 5 μM). In contract, p53 levels showed no difference following treatment with TSA or cotreatment with 5-azadC and TSA [Figure 1]c. Interestingly, as shown in [Figure 1]c lower panel, p21 levels were decreased after treatment with 5-azadC but not with TSA. We showed in our previous study that Grail is a novel p53 target gene that can modulate the protein stability and cellular function p53. However, the regulation loop of Grail-p53 axis is undetermined in oral cancer. To this end, we established cells stably overexpressing Grail or shRNA-silenced Grail in KB cells and investigated its effects on the p53 and p21. Consistent with our previous finding, Grail overexpression reduced p53 protein levels and its downstream target gene p21, while p53 mRNA levels remain affected. On the other hand, p53 and p21 protein levels are increased in KB/shGrail cells compared with controls [Figure 2]. These data demonstrated that Grail could exert the same effects on p53 protein levels in oral cancer cells. Since Grail can inhibit p53-dependent apoptosis in C2C12 and Saos-2 cells, we further confirmed the effect of Grail on stress-induced cell death in oral cancer cell lines. For this experiment, a pair of KB (KB/vector and KB/Grail) cell lines was used to examine the DNA profiles by FACS analysis in various stresses, such as Resveratrol and Etoposide. 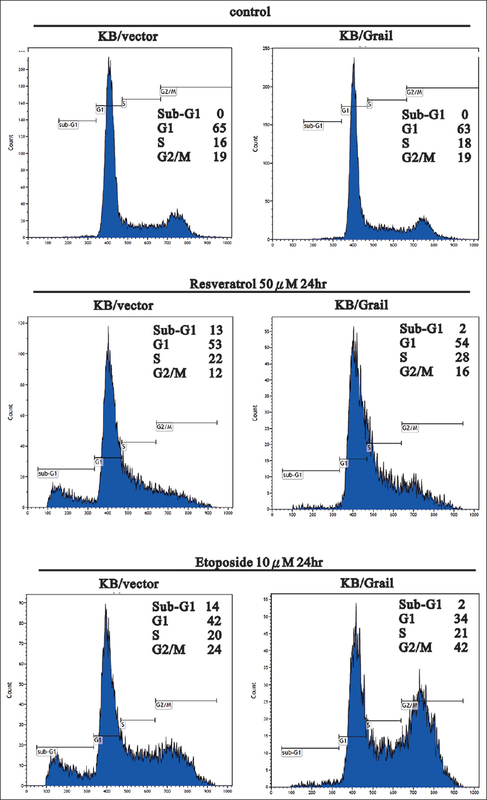 The data revealed that the scale of apoptosis after the treatment of Resveratrol and Etoposide was significantly diminished in KB/Grail cell line, comparing to its parental line, from 13% to 2% and 14% to 2%, respectively [Figure 3]. The results demonstrated that the apoptosis was repressed by the expression of Grail in KB cells. We further determined the roles of Grail in tumorigenesis by clonogenic assay in KB/Grail and KB/shGrail cells. This clonogenic assay tests the ability of cancer cells to grow independently of a solid surface, which is a hallmark of tumorigenesis. As expected, the data demonstrated that cells silenced for Grail have more colonies than controls. Conversely, Grail overexpression reduced the colony number [Figure 4]. The data indicated that Grail could inhibit tumorigenesis in oral cancer cells. Based on the mRNA levels of Grail, these results were derived from the raw Affymetrix data available in the public microarray database and the number of clones in the EST database offered by NCBI. Overall, these two lines of evidence clearly indicate that the expression levels of Grail in a variety of tumors are much lower than those of their normal counterparts. Consistent with our data, we revealed that mRNA levels of Grail were lower in KB and SAS cell lines. However, treatment with 5-azadC or/and TSA upregulated the Grail expression in oral cancer cells [Figure 1]. Surprisingly, cotreatment with 5-azadC or/and TSA has no synergistic effect on Grail mRNA expressions. Therefore, we suggest that 5-azadC or/and TSA, which is well known to increase the expression of many genes, can positively or negatively modulate Grail gene expression via transcriptional regulation. Many studies have demonstrated that mutated p53 is highly expressed in many tumors and possesses oncogenic activity that promotes metastasis, invasion, and proliferation. The turnover of mutant p53 is tightly regulated by Mdm2 as in wild-type p53. In this study, we demonstrate that Grail reduces p53 protein levels in KB cells. It would be interesting to know whether Grail can still interact with mutant p53 and affect its tumorigenic function by enhancing its degradation in oral cancer cells. Our previous study demonstrated that Grail was a p53 target gene. Downregulation of Grail inhibits p53-mediated apoptosis. It will be interesting to know whether Grail can cooperate with pro-apoptotic proteins (bax, puma, or noxa) in p53-induced cell death in KB cells. Grail has been shown to be involved the regulation of cell-cycle progression in naïve T cells through unclear mechanisms that might be related to the mTOR pathway. Our results show that Grail can mediate stress-induced apoptosis and cell cycle arrest through a p21-dependent pathway. This study also demonstrated that KB/Grail cells have less p21 protein levels compared to control cells. On the other hand, KB/shGrail cells have higher p21 protein levels than controls [Figure 2]. Interestingly, there is no significantly difference in the profile of cell cycle of those cells in normal condition [Figure 3]. Although Grail displays no apparent effect on cell cycle distribution, overexpression of Grail significantly inhibited colony formation of KB cells [Figure 4]. These findings imply that Grail may have a direct effect on cell cycle progression in oral cancer cells under stress. Interestingly, the determination of whether Grail can interact with p21 and regulate its protein stability and function will provide more information about how Grail controls cancer cell growth and proliferation. Future studies will be performed to investigate the possible molecular mechanism surrounding this issue. This work was supported by grants from the Ministry of Science and Technology (MOST 106-2320-B-016-008-and MOST 105-2320-B-016-001-to Y.-C. C.) and the National Defense Medical Center (MAB-106-092 and MAB-107-091). This work was financially supported by grants from the Ministry of Science and Technology (MOST 106-2320-B-016-008-and MOST 105-2320-B-016-001-to Y.-C. C.) and the Ministry of National Defense-Medical Affairs Bureau (MAB-106-092 and MAB-107-091). Anandasabapathy N, Ford GS, Bloom D, Holness C, Paragas V, Seroogy C, et al. GRAIL: An E3 ubiquitin ligase that inhibits cytokine gene transcription is expressed in anergic CD4+T cells. Immunity 2003;18:535-47. Kriegel MA, Rathinam C, Flavell RA. E3 ubiquitin ligase GRAIL controls primary T cell activation and oral tolerance. Proc Natl Acad Sci U S A 2009;106:16770-5. Nurieva RI, Zheng S, Jin W, Chung Y, Zhang Y, Martinez GJ, et al. The E3 ubiquitin ligase GRAIL regulates T cell tolerance and regulatory T cell function by mediating T cell receptor-CD3 degradation. Immunity 2010;32:670-80. Soares L, Seroogy C, Skrenta H, Anandasabapathy N, Lovelace P, Chung CD. Two isoforms of otubain 1 regulate T cell anergy via GRAIL. Nat Immunol 2004;5:45-54. Lineberry NB, Su LL, Lin JT, Coffey GP, Seroogy CM, Fathman CG. Cutting edge: The transmembrane E3 ligase GRAIL ubiquitinates the costimulatory molecule CD40 ligand during the induction of T cell anergy. J Immunol 2008;181:1622-6. Lineberry N, Su L, Soares L, Fathman CG. The single subunit transmembrane E3 ligase gene related to anergy in lymphocytes (GRAIL) captures and then ubiquitinates transmembrane proteins across the cell membrane. J Biol Chem 2008;283:28497-505. Su L, Lineberry N, Huh Y, Soares L, Fathman CG. A novel E3 ubiquitin ligase substrate screen identifies rho guanine dissociation inhibitor as a substrate of gene related to anergy in lymphocytes. J Immunol 2006;177:7559-66. Lin JT, Lineberry NB, Kattah MG, Su LL, Utz PJ, Fathman CG, et al. Naive CD4 t cell proliferation is controlled by mammalian target of rapamycin regulation of GRAIL expression. J Immunol 2009;182:5919-28. Lu X. P53: A heavily dictated dictator of life and death. Curr Opin Genet Dev 2005;15:27-33. Muller PA, Vousden KH. P53 mutations in cancer. Nat Cell Biol 2013;15:2-8.
el-Deiry WS, Tokino T, Velculescu VE, Levy DB, Parsons R, Trent JM, et al. WAF1, a potential mediator of p53 tumor suppression. Cell 1993;75:817-25. Herbig U, Jobling WA, Chen BP, Chen DJ, Sedivy JM. Telomere shortening triggers senescence of human cells through a pathway involving ATM, p53, and p21(CIP1), but not p16(INK4a). Mol Cell 2004;14:501-13. Kumar R, Gururaj AE, Barnes CJ. P21-activated kinases in cancer. Nat Rev Cancer 2006;6:459-71. Abbas T, Dutta A. P21 in cancer: Intricate networks and multiple activities. Nat Rev Cancer 2009;9:400-14. Sperka T, Wang J, Rudolph KL. DNA damage checkpoints in stem cells, ageing and cancer. Nat Rev Mol Cell Biol 2012;13:579-90. Chen YC, Chan JY, Chiu YL, Liu ST, Lozano G, Wang SL, et al. Grail as a molecular determinant for the functions of the tumor suppressor p53 in tumorigenesis. Cell Death Differ 2013;20:732-43. Suh YA, Post SM, Elizondo-Fraire AC, Maccio DR, Jackson JG, El-Naggar AK, et al. Multiple stress signals activate mutant p53 in vivo. Cancer Res 2011;71:7168-75.